We are Miami Beach car accident lawyers and have been representing clients in Miami Beach, Florida since 1970. There are many potential causes of car, auto and motor vehicle accidents within the Miami Beach and South Beach area, but unfortunately one of the primary causes of traffic collisions are drivers operating their vehicles while intoxicated. The Florida traffic crash facts for the year 2011 indicate that 197 of the traffic accidents in Miami Beach involved an intoxicated driver. Throughout Miami-Dade County, drunk drivers also put themselves and others in danger. Of the 248 deaths in the county, 58 involved a driver who was impaired by drugs or alcohol. In addition to driving while impaired, other top causes of auto accidents in Miami Beach and South Beach, included risky behaviors such as operating a cell phone while driving; driving while fatigued; going too fast for road conditions or for the posted speed limit; or engaging in aggressive driving by tailgating or speeding. If any driver does anything wrong or negligent that is more careless than what a reasonable motorist would do and/or that violates state laws, the irresponsible driver can be held accountable for compensating seriously injured victims or family members of those killed in motor-vehicle accidents. 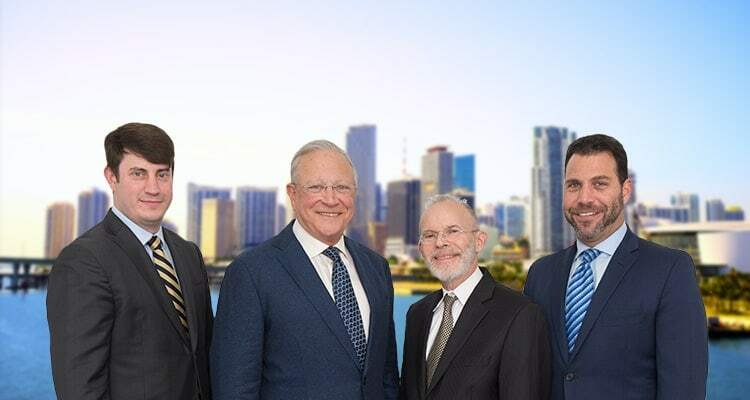 If you or a loved one is injured and you wish to pursue a claim for compensation, the Miami Beach car accident lawyers at Gerson & Schwartz, P.A. are here to help you. Contact us via phone at (305) 371-6000 or contact us online today to schedule your free personal injury case evaluation. As of the 2010 Census, Miami Beach had a population of 87,779 residents. Bordered by the Biscayne Bay, North Bay Village, Fisher Island, Indian Creek, Surfside and the Atlantic Ocean, the city of Miami Beach Florida covers 2.5 square miles. Within these city limits, there were a total of 2,247 car accidents in the year 2011 according to Florida’s traffic crash facts. In the county where Miami Beach is located, Miami-Dade, there were a startling 42,171 auto accidents over the course of this same year. These accidents in Miami-Dade County made up a good portion of the 227,998 car accidents that occurred throughout the entire state of Florida, which caused 181,654 people to be injured and another 2,400 motorists to lose their lives. Florida is comprised of many large cities as well as coastal resort towns. The warm weather, the relatively low cost of living compared with other coastal communities, and the low taxes all make the state of Florida a very attractive place to retire. Florida is also popular among spring breakers as well as snowbirds who just live in the state for the winter months. While there are many great areas to live or visit in Florida, one of the most vibrant, famous and exciting places is Miami Beach. Located within Miami-Dade County, Miami Beach is on a series of barrier islands that stretch between Biscayne Bay and the Atlantic Ocean. The city’s Art Deco Historic District has the largest collection of art deco architecture in the entire world and has been listed on the National Register of Historic Places in the United States. The art community, is just one of many things that draws people to Miami Beach, along with its tropical climate and the famous South Beach area. Unfortunately, with so many tourists and with the area being so populated, Miami Beach is also the site of many auto accidents. If you or a loved one is the victim of a wreck, a Miami Beach car accident lawyer at Gerson & Schwartz, P.A. can represent you and help you understand your rights. To read more about other practice areas our law firm has direct experience click here. Se Habla Español.